A Christian place of worship has existed on the site of our church since the Anglo-Saxon era. The name Offham first appeared in a Charter from 832 A.D. when Aethulwulf, son of King Egbert and father of Alfred the Great, gave the estate to what we know no as Canterbury Cathedral. Doubtless, a wooden church would have existed at that time; built by Offham’s Lord of the Manor to serve as his private chapel. 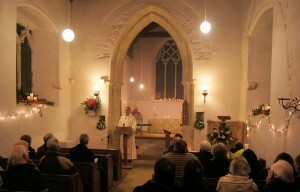 It was not intended for the use of the villagers, which, in turn, explains why the church is so far from the centre of the village and the village green. He built it so that he could easily walk to worship. He didn’t have much concern for anyone else! The church is not mentioned in the Domesday Book but we can assume with some confidence that it existed at that time because of the Textus Roffensis. The Textus Roffensis (1122-1124 A.D.) is the only existing copy of the first ever code of English law and was written in Rochester. That document records that Offham Church was one of a list of churches in the Diocese of Rochester at that time which paid fees to its mother cathedral for Holy Chrism Oil. The first stone church was built around 1080 AD and was a Saxo-Norman building. In other words, it was built after the Norman Conquest but it was built in the Saxon style. Its builder may have been Anschitil de Ros who was Archdeacon of Rochester Cathedral at the time and was one of the listed tenants of Offham in the Domesday Book. He was a Saxon who prospered under the Normans and was the tenant of a number of manors, including Offham. One of the reasons why Offham is such a special historic church is because some parts of Anschitil’s church remain with their distinctive Saxon style stonework. The lower stage of the tower, which is unusually placed on the north side of the chancel, parts of the side walls of the Nave, and a small amount of stonework in the North-East outer wall of the Chancel all date from this time. It can be identified by the herringbone style in which the stones have been arranged. Most of the building that we have today was built in the 13th Century although there were many changes made later in the 14th and 15th Century. Decorated windows were built, a pointed chancel arch was inserted and ‘squints’ were inserted to enable people to see what was happening at the high altar. The ‘squints’ are gaps in the stonework still visible and useful today! The greater part of the fabric of the building is from the next two centuries. In the 13th century the Chancel, which had been enlarged in late Norman times, was reconstructed to accommodate six lancet windows and a crude pointed arch into the tower. A south aisle was added to the nave probably as a chantry chapel, but then subsequently removed again in the 14th century. You can see the tell-tale signs that St Michael’s had a side aisle at one point because the outline of the arches remain in the south wall of the Nave. Another reason that St Michael’s is considered such a special little church is that the Chancel arch has a rare feature in that there are two Hagioscopes, one each side of the arch. Hagioscopes were probably provided in the responds of the arch to enable priests at side altars in the nave to see what was happening at the high altar. Mass was often said at several altars at the same time and these internal ‘windows’ allowed the priests to co-ordinate their ceremonial movements. The stained glass in the east window includes St Michael (to whom the church is dedicated) and was erected in memory of William Addison and his wife Julianna, by their children Emily Cosgrave (1876-1971) and Caroline Knowles (1888-1974), all associated with Offham. A list of rectors hangs near the entrance and begins with Edward who was installed in 1267 AD! During the rectorship of Canon Geoffrey Young (1966-81), Offham was joined with West Malling. 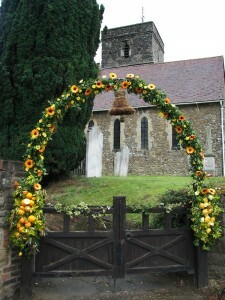 Being the parish church for Offham, St. Michael’s churchyard is the main burial ground for the village. Six chest tombs are Listed Grade II independently of the Church and the village’s War Memorial is set in the Churchyard. John Grierson (1909-1977) is buried in the Churchyard. John was a long-distance flier, test pilot and Polar Explorer, who died in Washington DC but was returned to Offham for burial.